The only place Democrats rack up big wins is in the core counties of the nation’s largest cities. Everywhere else, it’s either a close race or a runaway victory for Republicans. The trend is pronounced and has been accelerating since 2010. With the primary season giving way to November’s general election, we’re certain to hear the familiar – though not exactly accurate – tale about the role of rural voters in previous congressional races. The story we’re told is that rural residents, troubled by the race or policies of President Barack Obama, switched to the Republican Party, delivering the Congress to the Republicans in 2010 and, six years later, the presidency to Donald Trump. According to this story, a change in the way rural residents voted changed the way U.S. politics operated. This is at best a misleading and incomplete account. And it also misses a more important trend in the nation’s politics since Barack Obama won the presidency in 2008: the increasing concentration of Democratic voters into the largest metropolitan areas. It isn’t just that the Democrats have lost their hold in rural communities since 2008. Once you get outside the central counties in metro areas of a million or more people, Democrats have struggled to break even. Once you’re beyond the central counties of medium-sized metropolitan areas (250,000-999,999), Republicans have been winning in a rout. Democrats don’t have a rural problem. They’ve got an everywhere-but-the-nation’s-largest-cities problem. None of this is exactly new. These trends have been evident since at least 1980. But the shifts are accelerating. You can see what’s happening in the charts above. They track the percent of Republican and Democratic votes for House and presidential candidates since 2006 in six geographic categories. To help show how this is a metropolitan voter issue, not just a rural voter issue, we’ve gone beyond the simple urban/rural categories to look at how Americans in differently sized metropolitan areas voted. From left to right, top to bottom, the county types range from the largest metropolitan areas to the smallest, rural counties. Major Metro Core: Central counties of major metropolitan areas (1 million and up). Major Metro Suburbs: The suburban counties of major metropolitan areas. Medium Metro Core: The central counties of medium-sized metropolitan areas (250,000 to 999,999). Medium Metro Suburbs: The suburban counties of medium-sized metropolitan areas. Small Metro: All counties in metropolitan areas of 50,000 to 249,999 residents. And Nonmetro/Rural: All counties not located within a metropolitan statistical area.. The blue and red lines denote congressional races; the red and blue columns denote presidential races. Winning in the giant cities is a big deal. The metro areas of a million or more accounted for nearly 55 percent of the total vote for the House of Representatives in 2016. Democratic candidates do best in the core counties of these giant metro areas. In 2016, Democratic House candidates won these counties by 10 million votes – that’s nearly 30 percentage points. Rural votes (defined here as voters in counties outside metropolitan statistical areas), meanwhile, accounted for only 15 percent of the electorate. Republican House candidates won these rural counties by just over 6 million votes in 2016. That’s a victory of nearly 35 percentage points. But two things stand out. First, rural voters stuck with Democrats in President Obama’s first run for office. Democrats won nearly half of the rural House vote in 2008. In that year, with a liberal African American candidate leading the ticket, rural voters increased their support for Democratic candidates. 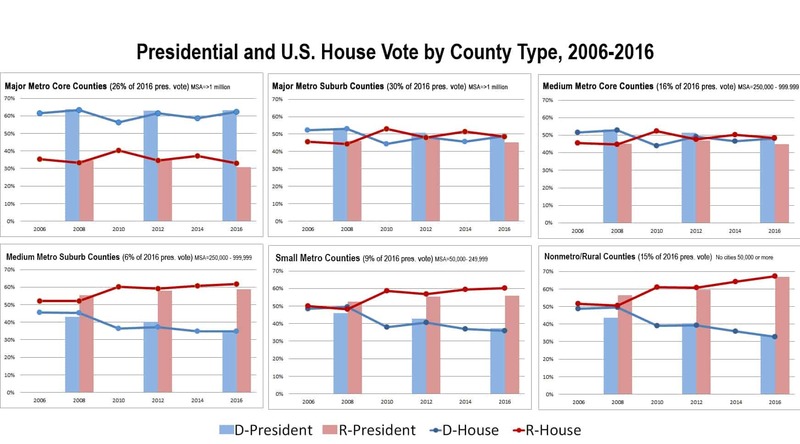 Democratic candidates in rural House districts in 2008 lost to Republicans by only 166,000 votes, a difference of less than 1 percentage point. The Democratic collapse in rural counties didn’t come when Barack Obama was initially at the top of the ticket. The major shift came in 2010, two years after Democrats took the White House and Congress. These trends reappear when charting the votes for president. In 2004, John Kerry, the Democrat, won about 40 percent of the rural vote when he lost to Republican George W. Bush (this race isn’t shown in the graphs above). Four years later, Obama won 43 percent of the rural vote. Rural voters didn’t turn away from Obama and the Democrats in 2008. The young Illinois senator and House Democrats increased their take of the rural vote. By 2016, however, Democrats had lost ground in most places outside the major metros. In House races, Democratic vote totals were down by over 30 percent in rural counties from 2008 to 2016. In the same period, Democratic totals were down by 24 percent in cities under 250,000, by 18 percent in the suburbs of cities under one million and by 4 percent in the central areas of cities under 1 million. House Democrats gained a few votes between 2008 and 2016 in the central cities of the major metros. But those gains were paltry compared to the loss in support in the rest of the country. The presidential vote looks a lot the same — there’s a steady erosion of support for the Democrat outside the major metro areas. For a “blue wave” to crash into Washington this election season, Democrats will have to do more than activate the major metropolitan base. That tactic was enough to get Obama re-elected in 2012 but not enough to fend off Donald Trump in 2016. And for congressional races, it hasn’t been enough to win a House majority since 2008. Bill Bishop is founding co-editor of the Daily Yonder and author of the book The Big Sort: Why the Clustering of Like-Minded America Is Tearing Us Apart (Houghton Mifflin, 2008). Tim Marema is editor of the Daily Yonder.